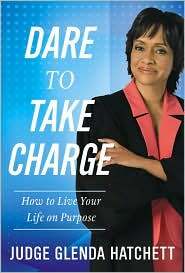 This book, Dare To Take Charge is a special gift from Judge Glenda Hatchett. The writing style of the book is filled with a caring heart for her family, the young people and parents she met while on the bench in Fulton County, Georgia. This book also shows her intense interest for the community when she is not sitting on the bench. Judge Glenda Hatchett is one of those people who carries her heart on her shoulder for all to see. She has a heart of action that will reach out at any time to give extra time to help a person out of a dark place and into a healthy, well lighted environment. If she needs extra help, she will call and ask for it. Believe me she knows lots of important people. These other people are capable of turning a person's world around too.